Florida Real Estate License Requirements - A Simple Step-by-Step Guide! The state of Florida requires anyone looking to obtain a Florida real estate sales associate / agents license to complete a 63-hour Pre-license course, submit a state application, and pass the state licensing exam. This article will explain each step of the licensing process in complete detail. To get your Florida real estate license you must complete this required course in order to qualify for the state licensing exam. The course can be completed in either a classroom or online format. The most important thing is to make sure that you are taking a course from a state approved education provider. We strongly encourage you to do your research about an education provider before enrolling in any course. We also recommend avoiding schools that offer courses in multiple states. These education providers often provide you with generic content that is not specific to Florida and the Florida real estate exam, making it difficult to pass and get your license. 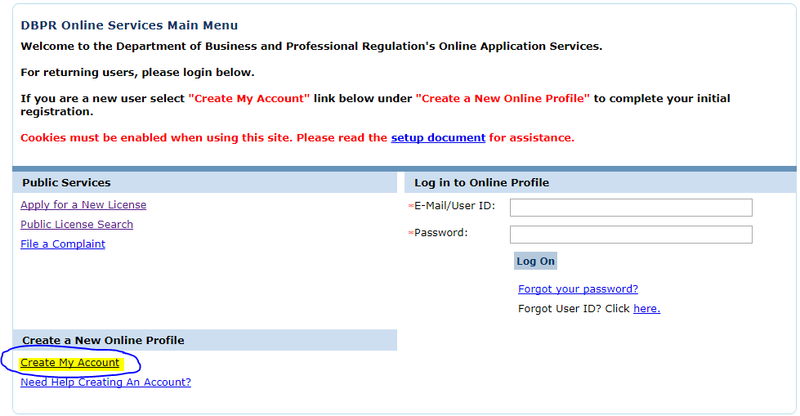 Applicants can apply online using the DBRP’s Online Services link and creating a new online profile as seen below. Upon approval of your application, the state will send an email notifying you that you can now schedule your state exam with the Person Vue testing center online or by calling 1-888-204-6230. With your 63-hour Pre-license course complete, your state application approved, and your exam scheduled, it is now time to prepare to pass and get your license. The exam consists of 100 multiple choice questions that must be completed within 3 hours. Test takers must achieve a score of a 75% or higher in order to become licensed. Gold Coast School of Real Estate has been preparing students to obtain and renew Florida Real Estate licenses since 1970. Gold Coast offers the required 63-hour Pre-license course in English and Spanish in both classroom and online formats. By combining education with exam prep resources, videos, and practice exams, along with a flexible schedule and tuition policy, Gold Coast has served as Florida’s leader in real estate education. Learn more by contacting a helpful Career Counselor at 1-800-732-9140 or by visiting www.GoldCoastSchools.com .